It was not long ago, on this very blog, that I was saying that I didn't think Dante was cool anymore. Now, as if in response to that, Capcom has unveiled a brand new Dante. 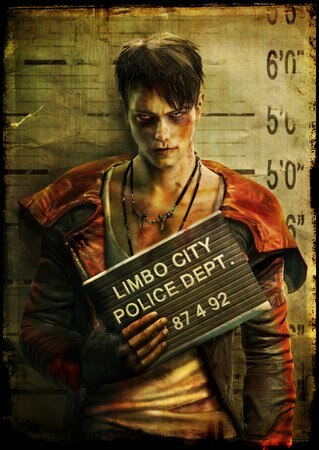 This emaciated, vampiric Dante will be starring in DmC, a series reboot from English developer Ninja Theory (Heavenly Sword, Enslaved). At this stage, it's really too early to tell if this is an improvement or not. I kind of dig the new, more urban duds. His signature bold red is still there, but it's more subdued, and the overall ensemble is sleeker and less showy, more casual--a good fit for his lankier frame. Check out the trailer, and you'll see that Ninja Theory's take still has all the right moves (no actual gameplay footage, however) and retains at least some of that swagger that DMC2 Dante was so sorely lacking. The hair and face are startling, however, and I'm not sure how I feel about that. Setting aside good or bad, it's just shocking that Capcom would essentially jettison (or allow Ninja Theory to jettison) the iconic look of one of its most recognizable characters. That they had to bring in Nero with DMC4 already suggested that maybe the material had run its original course, and the series was due for a hard reboot. I would have been okay with tossing all the existing mythology and supporting characters (Trish, Lady, Nero, Vergil), but here they have seemingly gotten rid of Dante himself, replacing him with a different guy who only happens to have the same name. What makes this weirder is that the old Dante (in his DMC3 incarnation) and Trish are going to be in next year's Marvel vs. Capcom 3, giving the impression that Capcom itself isn't clear on its direction for the franchise. The trailer is somewhat ambiguous, so I suppose it's possible that this guy is just some psychotic who only thinks he's Dante. If the "real" Dante shows up later, in a similar capacity as he did in DMC4, then that could even be a cool twist. Of course, Hideki Kamiya will tell you that the only "real" Dante is his DMC1 self (although I'm not sure how much of a hand Kamiya really had in designing Dante in the first place). Whatever. Mixed feelings on new Dante aside, the trailer looks, yes, cool, and I'm looking forward to seeing more. Honestly, I'm more worried whether Ninja Theory will be able to capture the deep combat of the series's better installments. I played a bit of Heavenly Sword, and it seemed pretty shallow to me. On the other hand, a more mainstream, casual Devil May Cry might not be a bad thing, so long as it's not like DMC2. Seeing the trailer just made me think of Infamous and that other totally forgettable but similar game from Activision. Another mopey, brooding, young protagonist. Bleh. I haven't played either of those games, but I just looked up a video of that Activision thing. Dude seems to be rather a sociopath, but I can see what you mean about this Brit punk Dante being perhaps cut from the same cloth. I wish I could just say "as long as it plays well," but, yeah, this stuff does matter.